Wow, where has the time gone. I feel like Christmas was just a couple weeks ago, not almost a whole month ago. We have had a really good weekend at home. We have played & played. On Saturday night we had a special treat of Jack's Birthday party. At the party was Teddy who is almost a year old and decided to take his first steps from his mommy to his Grandpa. It was so exciting, but scary to think that Gray is close to being that little boy! I don't need him walking so soon! Yesterday Gray decided it was time to learn to walk around the furniture, and boy has he accomplished that quickly! He has been so mischievous this weekend. He knows that he needs to stay away from the radio and gate, but I don't know if he loves us yelling "Gray, NO" or he loves us coming and picking him up to move him. Regardless of what we do, he smiles & giggles the whole time. It's really hard not to smile back at him he is so cute. 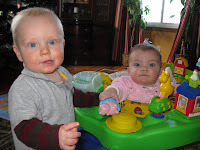 Well it's back to work tomorrow for us, and I think Gray will be happy to be back at day-care with all the other kids. We are hoping for a short winter, because we are getting stir crazy here! We had a wonderful 1st Christmas for Grayson. On Christmas Eve, Daddy & Uncle Ted smoked a turkey on the grill while Mommy & Gray went to church. Gray went to bed & the rest ate the wonderful turkey. Christmas Day was uneventful, Gray opened his only gift under the tree (as Santa knows that a 9 month old baby, doesn't need anything yet). Gray then played all day and had a few naps. Wow, I can't believe that it's almost Thanksgiving. I feel like just last week was Halloween. 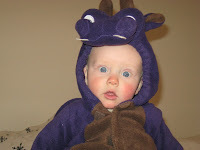 Gray was the cutest purple dragon. 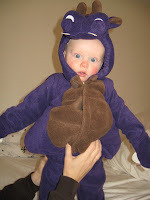 He didn't like his outfit much, due to it was so warm! It had all this padding around his tummy and he just got way too warm. 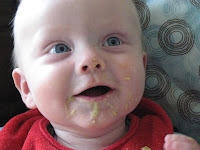 Gray is doing great - he now has 8 teeth. 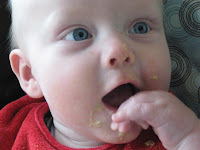 We had a weekend of getting 6 teeth at once, let me tell you what fun that was! We have a great routine down, but unfortunately it has him going to bed by 6:30. I just don't feel like I get enough mommy time. I look forward to the weekends, and then they go by so fast! Andy is gone next weekend for hunting in Wisconsin. Here's hoping he doesn't get one this year! I'm not a venison fan, and we don't have room in the freezer! 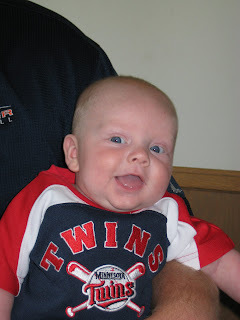 I am looking forward to Thanksgiving, we are going to Andy's mom's side in Red Wing. It will be great to see everyone. I think he is still upset, as he is a little "off" today. Hopefully all will be well for next week, as we are meeting Tina and the triplets at the Zoo on Tuesday. We can't wait to see how big they are! Grayson is 6 months old! 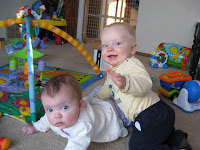 Gray has now been at day-care - Jeanne's for 3 months and he loves it. He goes happy and is happy when I pick him up. 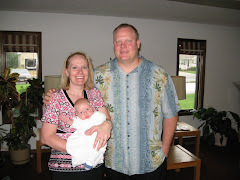 A new baby starts tomorrow - so he will need to start accepting that he is no longer "the baby". Andy and I have been busy also. Andy has school (both teaching & graduate) and I am busy at work and taking care of Gray and Bella (dog). We get home and the night just flies by - I am already missing the daylight that we loose everyday. Wow, where has the time flown? Grayson turned 4 months old yesterday. Every day I still can't believe that he is here. Gray is having an "off" day today. Daddy said that he slept alot and he wasn't his normal upbeat self when I came home. 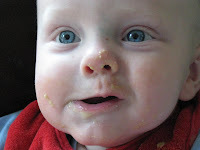 Oma (my mom) and I believe that he is starting to teeth, as all my brothers & sister and I teethed at 3 months. He has gone to bed for the night and I'm hoping that he does sleep well. Grayson starts day-care next Monday - so I'm excited to see how tired he is at the end of the day after playing with the other children there. I can't believe that Friday is August - pretty soon the State Fair will be here - and that means the end of summer. 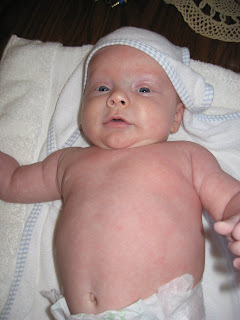 Grayson had a refreshing bath this morning - it was one of the few where he was not screaming the whole time. I'm hoping that he is over not liking baths. Andy is up in McGregor fishing with his friends Tim, Gretchen & Tanner - hope he gets a nice walleye! Grayson and I are on our way to Harmony with my sister Heather & Zeus. Can't wait to have Grayson see his first parade. What are you looking forward to most for Spring?